Download our app and test it for free. With only one tap you create or finish a record. 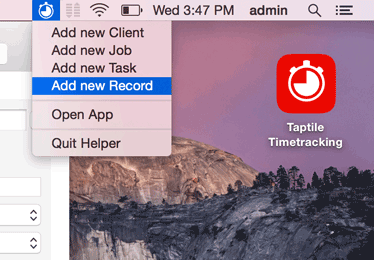 When you’re done with a task, or want to work on a different task, you can choose the red stopwatch button for that record and stop tracking or create a new record for that task. Or you choose a date from the calendar and track a new record for that day with the white stopwatch button at the upper right. The clear and plain design optimally supports you with your work. 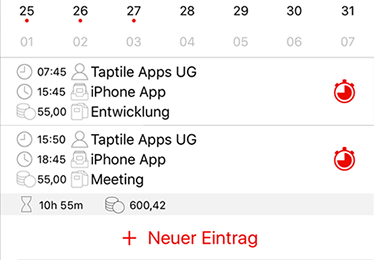 You immediately see in the calendar, that you can switch between week- and month-calendar, what you are working on today. 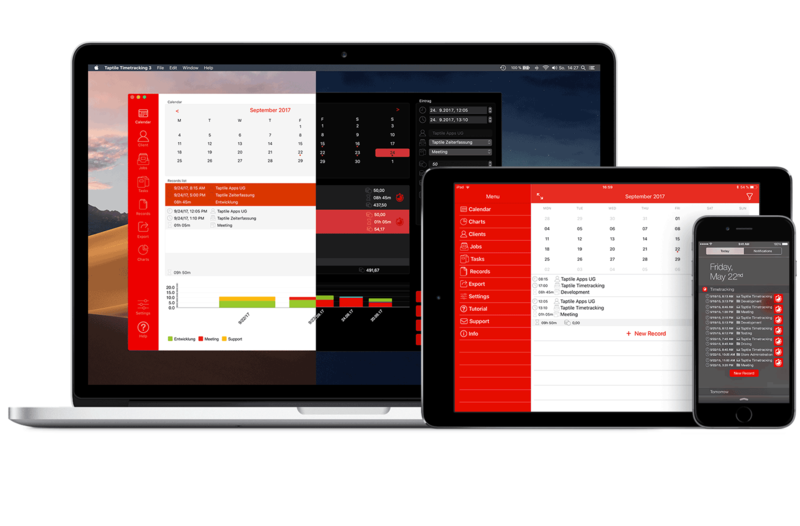 The footer displays the current totals working hours and daily revenue. The app has a clear and efficient structure. Immediately it is clear to order your records in tasks and jobs on which you are working. The menu allows quick and direct access to all areas of the app. 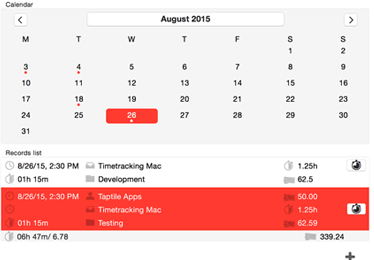 With the filter you can filter the records for the calendar, the records list and the export. 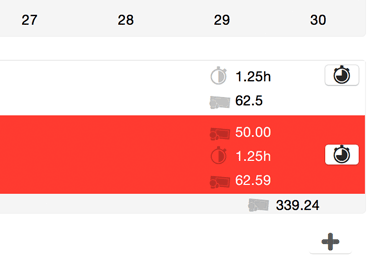 You can easily filter by client, job, task, note or time selection. So you see very simply, how much you worked or earned on a job. In the Filter menu, you can enter a searchtext (eg a job name) or a period. Weekly, monthly and annual periods can also be defined relatively (eg the last month). The recently used Filters will be saved. When active, the filter button is filled and all the filtered records are no longer displayed. 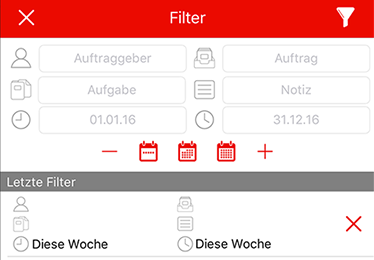 Do you want to disable the filter, open the Filter menu again and remove the filter input. Objects in lists are now multiple selectable. Deleting, flagging and archiving of items is super easy. Flagged items will be displayed coloured in the lists. Archived items can be hidden in the lists (see App Settings), for better overview. If you ever want to record only one item at a time, you can use the Single record mode in App settings. It ends all running records, when creating a new one. You never will forget to stop a record with this! 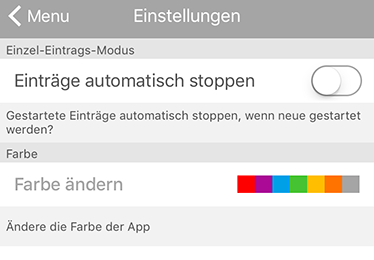 You want to change the App colour? Now this is no problem! You can choose your favorite from one of six colours and gray. 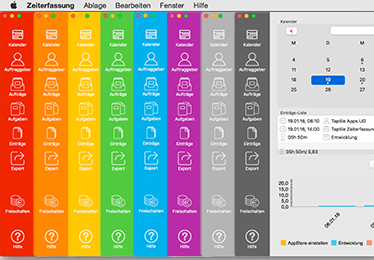 The same colours are present now in our macOS Application. You can use the Export to easily create a file of the (filtered) list of your entries. Available for the Export are CSV (for further processing the data in Numbers, Excel or Open Office) and PDF (if you want to print the file). 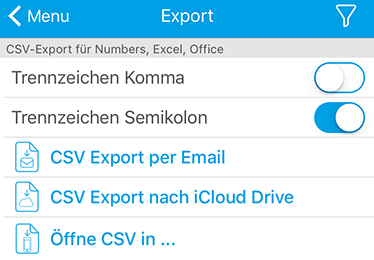 You can open the exported file in another app on your device or send it via email to someone else. 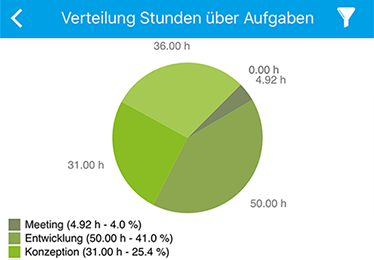 The app provides awesome graphical reports that display the distribution of recorded working hours on jobs, tasks and days. 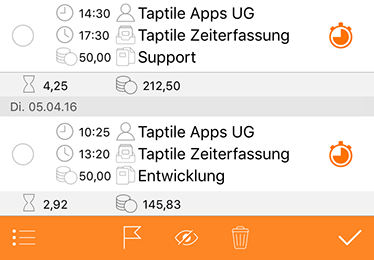 The filter here also is a powerful tool to flexibly adapt the charts to your specific reporting needs..
Automatic and easy synchronization of your records over all your devices is supported via the Apple iCloud. Activate the iCloud sync in settings. And all your data will be synchronized easily in the background. 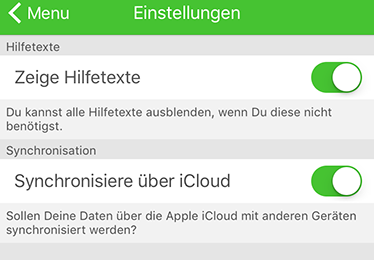 Pay attention to correct iOS iCloud settings: Enable "Documents & Data", our app and "Use Cellular Data" in the iCloud settings! Also on the exports screen (below the PDF export) the database backup can be found, that works very user-friendly via email. 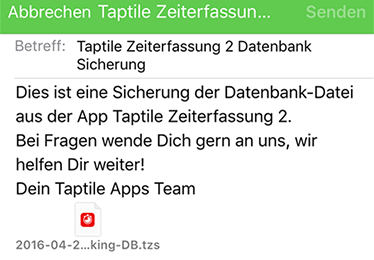 With one tap a database backup is sent via email. And with another tap this database backup is imported from the email again. Backups can not be easier! Whenever you close the app, you will be notified on the number of currently active records. 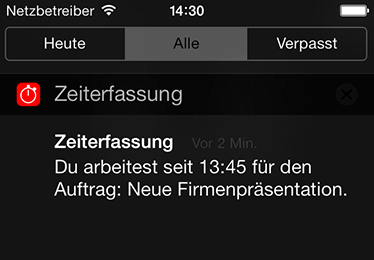 In the iOS Notification Center you can always check, if a record is currently active. Or you can use the iOS Lock Screen for direct access to the app. That way the access time to the app can be reduced to a minimum. You immediately see in the calendar, what you are working on today. 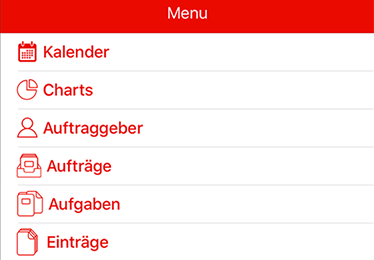 Activate the Menubar helper in Settings of our app. It is available also, if you quit the app. It is totally easy to create a new Record, Client, Job or Task with this Menu. 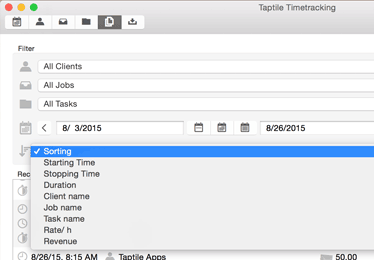 You can easily filter by client, job, task, or time selection. So you see very simply, how much you worked or earned on a job for example. 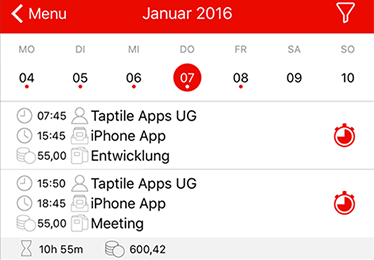 Weekly, monthly and annual periods can be set quickly with the special buttons in the middle. The filter here also is a powerful tool to flexibly adapt the charts to your specific reporting needs. 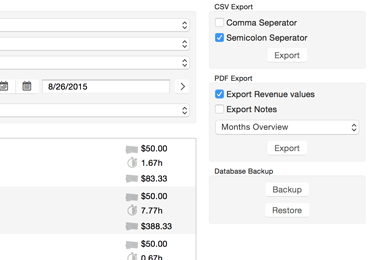 Also on the exports screen (below the PDF export) the database backup can be found. With one tap a database backup is created and saved to a file. And with another tap a database backup is imported again. You can choose your favorite color for our app. 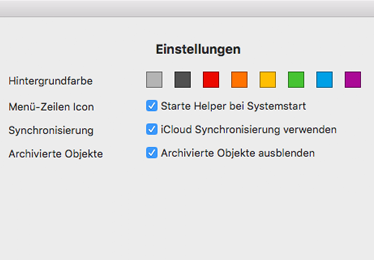 Open the Settings and switch to the color of your choice. Our app will reflect it immediately. Display problems with window size fixed, automatic display of newly created objects improved, further bug fixes. 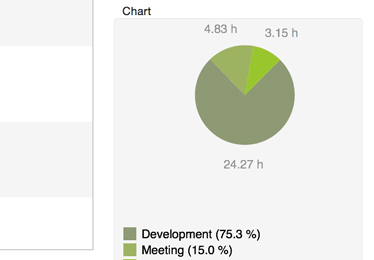 Support for macOS High Sierra (10.13) added, charts moved to separate area, iCloud sync activity display built in, new action buttons added. (For example, it is now possible to create a task or record directly for a Job).